Blogger promises us that our blogs will be ours, forever, and that we are free to publish our blogs in privacy, if we so desire. They do this by protecting our Blogger accounts behind Two Factor Authentication. Both the name of our Blogger account, and the password used, are our secret to keep. I forgot my account name - can you tell me what it is? When you setup a Blogger account, you provide an email address, which will be used for recovering forgotten account names and passwords. If you forget the account name, or need to reset the password, you can use the Forgot your username or password? wizard. "Forgot?" has two options, which you use depending upon what you know. The "Forgot?" wizard gives you two options, and sends a recovery email message accordingly. Recover access to an account. Provide the account name (the email address that you provided when opening the Blogger account), and the email goes to to the primary email address for that account. Recover access to the blog. Provide the URL of the blog in question, and the email goes to the owning account(s) for that blog. There are several interesting details, with the "Forgot?" wizard. The wizard works only for BlogSpot URLs. If the blog is published to a non BlogSpot URL (as a custom domain), you will need to provide the original BlogSpot URL. The wizard works for all BlogSpot URLs - regardless of the Country Code alias which affects the blog owner. Whether the owner is in Canada (and seeing "xxxxxxx.blogspot.ca"), in Mexico (and seeing "xxxxxxx.blogspot.mx"), or in the USA (and seeing either "xxxxxxx.blogspot.com" or "xxxxxxx.blogspot.us"), you use only the "xxxxxxx" BlogSpot name, in this wizard. The wizard works only for active URLs. If the blog is deleted, either by you or by Blogger, you won't be able to recover access. You will only get the recovery email, when you login to the recovery email account. You have to use an active email account, for recovering your login information. Blogger will not tell you the email address, since the account name / email address is kept a secret. Blogger cannot tell you anything, if you have intentionally obscured your identity. In cases where the account was last used under Old (Pre 2006) Blogger, the Claim your blog wizard may be used - but note that Legacy accounts are no longer supported, in general. A third possibility would be the Google Having trouble signing in? wizard. You may also find Google Accounts: Secondary Email Address to provide relevant - if not welcome - advice. In any case, your personal identity is kept a secret from others - as other folks identities are kept a secret from you. If you don't have access to the email account that's associated with the Blogger account, you don't get the email. That restriction leads to interesting scenarios - such as mysterious email received from the Forgot Password wizard, caused by desperation. Whether you use either "Forgot?" wizard, when you open the email and login to Blogger as part of the authentication process, be sure that you provide / use the right Blogger / Google account. Alternately, clear cache, cookies, and sessions - then restart the browser - before executing either wizard. 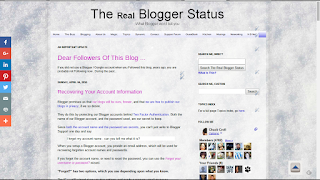 Do not claim or recover the blog, to an unknown or unexpected account. Recovery is easiest done, using two browsers. Account recovery will involve accessing two accounts, simultaneously - and is best done using two browsers. It's possible that understanding the relationships between Blogger accounts, email addresses, and Google accounts may reduce your need to continue. If your account is based on a non GMail email address, you may wish to consider the special relationships. Your next possible solution is to try using the Blogger "Forgot your password?" wizard. If "Forgot?" does not provide you enough clues, you're entitled to ask Blogger Support for help - but you need to understand the limitations of their ability to help. If you choose to ask for help, consider making an effort to recover access to your GMail account, or to your non GMail account, as necessary. And when you check your email accounts, GMail or non GMail, check carefully. Having recovered the account, you should be able to find the blogs previously owned - and possibly un delete them - starting from the "Deleted blogs" dashboard list. Some blog owners lose access to their #Blogger accounts - either forgetting the account name / password, or letting the blog go dormant and requiring demographic authentication when trying to access later. They expect that Blogger will just send them an access token, without verifying that they are the rightful owner. They fail to observe that Blogger wants them to continue publishing their blog - and does not intend to let unknown parties have control of it, through failure to require verification of identity. Thank you! It actually worked!!! Thank you so much! I've been trying to retrieve this for one week, and your advice worked. But what if the email provider has gone bust - you can't now get the email reminder! 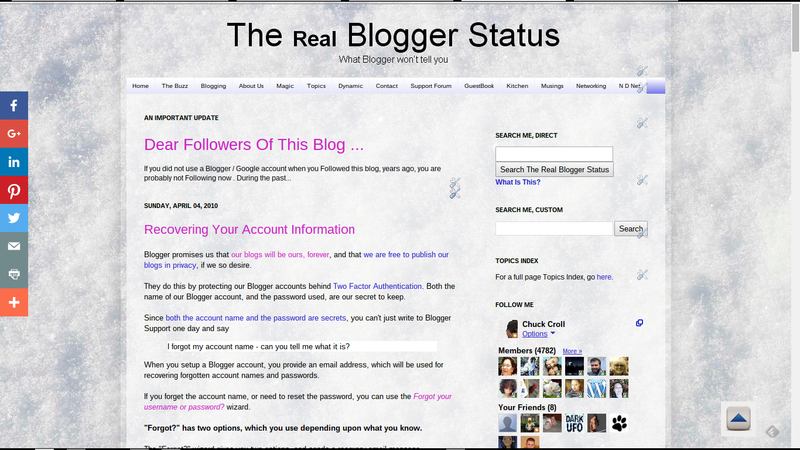 And you can't reregister the blog as it exists!! Help please. Please, Please, Please, help me out here. Why is it that the authentication process, for so many people, starts with use of the back door authentication token (backup email account, now unavailable), rather than actually remembering and using the front door authentication token (account name, and password)?